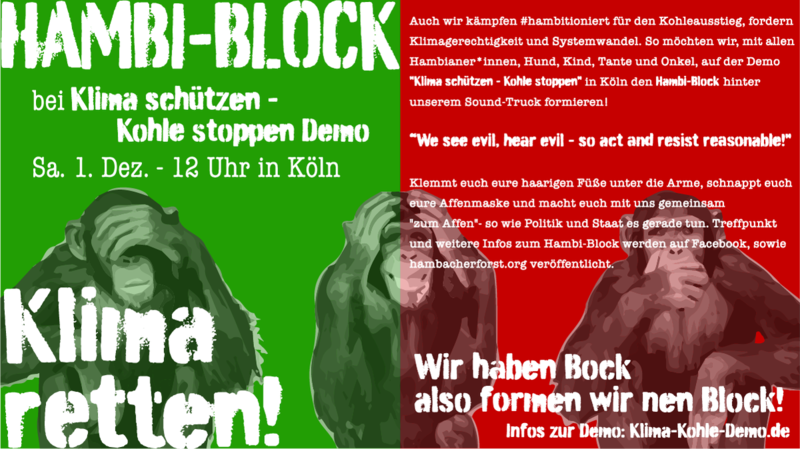 On 19 November, activists in a question and answer session on security confronted North Rhine-Westphalian Minister of the Interior Herbert Reul with topics from the Hambach Forest. Threat of the NRW regime: penalty payment of 20-25,000 euros if the meadow is not cleared until 11.12.2018! 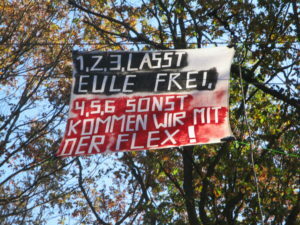 With the threat of a penalty payment of 20-25,000 euros, the NRW regime, represented by the district of Düren, positions now their sharpest cannon to urge me to clear the protest and resistance camp on the meadow at Hambach Forest. A penalty of 20,000 – 25,000 euros, I can not come up with it just like that. 22:00 During today’s police operation, the meadow camp was stormed by about 100 officers with 20 vehicles and a helicopter under threadbare pretext. Based solely on the assertion of 2 RWE security guards, that a stone was thrown at them. Witnesses can confirm that this statement is false. The personal details of a dozen people were checked using force and two activists were reported on the alleged suspicion of violence. A detailed report will follow later. 17:27 We just got a message, that civil cops are on the motorway near Kerpen, controlling cars that are going direction Hambi. Be attentive!! 16:38 Cops around and in Wiesencamp (meadow) at the edge of Hambach Forest.